July 11, 2018 - The Iranian opposition held a large rally with the presence of Arabic and Western personalities that support the Iranian resistance. The delegations that participated expressed their support for NCRI and its president, Mrs. Maryam Rajavi, in their goal for regime change in Iran. The participants also stated that the Iranian opposition has the capacity to topple the Iranian regime, given the ongoing protests in Iran and the NCRI and MEK’s history and connections in Iran. After the convention started, a minute of silence was given to the martyrs of the Iranian resistance, murdered by the Iranian regime. Next, a delegation of 50 French mayors took the stage. 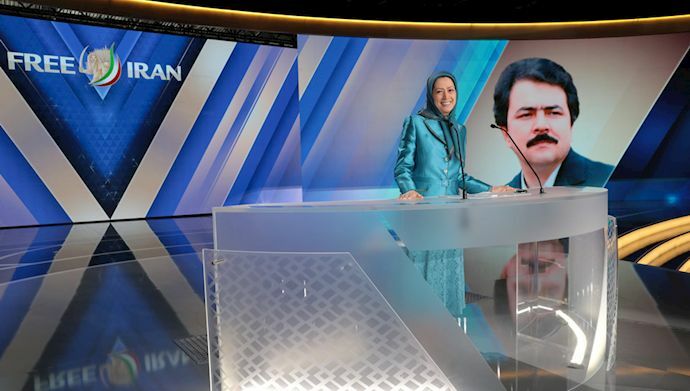 The mayor of Paris’s 1st Arrondisement spoke on behalf of the delegation and expressed support for the Iranian opposition and the people of Iran in their goal to topple the Iranian regime. Also among the dignitaries who spoke at the event was Nejat al-Astal, member of the Palestinian parliament. Al-Astal hailed all the participants of the gathering and the Iranian opposition’s commitment to human rights. Saleh Al-Qalab, politician from Jordan, described the Iranian regime as an evil government that kills its own people and expressed hope that the next Free Iran gathering will be held in Tehran. The gathering also featured video clips from supporters of the Iranian opposition inside Iran. Videos broadcasted at the event showed men and women from different cities inside Iran holding pictures of Mrs. Rajavi and expressing support for the Iranian opposition. The filming was done in secret and they had to hold the pictures in front of their faces to conceal their identities. In her speech, Mrs. Rajavi saluted all the cities in Iran that have been protesting against the regime. “I have come here on behalf of a Resistance movement which has offered its entire existence to ensure the victory of the Iran uprising, and for Iran’s freedom, pride, and magnificence,” she said. She also warned the heads of the Iranian regime that the end of their rule will soon come. Rajavi also stressed that the ongoing protests have proved that the thought that the regime can be reformed from within is an illusion. Mrs. Rajavi also praised the people of Isfahan and Khuzestan and Kurdistan for their ongoing uprisings. “Iran rose up again, with all its children, with all its nationalities and ethnicities,” she said in her speech. Rajavi also said that the Iranian regime has lost the support it enjoyed from proponents of the appeasement policy in the previous U.S. administration and its capacity to wage war and chaos in the Middle East has diminished. 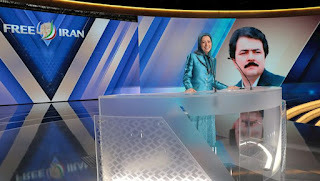 Rajavi said that what terrifies the regime is the connection between the Iranian resistance and the underprivileged masses of Iran. She added that the NCRI is ready to establish a state that is based on democracy, freedom and equality of all the people, separation of church and state and self-governance for minorities. She stressed that Iran will be nuclear free and will cooperate with the international community. Rudy Giuliani, former New York mayor and lawyer to the U.S. president, was among the U.S. delegation and said that the overthrow of the Iranian regime is within reach. He said that there was a similar opportunity in 2009, when the people of Iran poured into the streets and protested against the regime, but the previous U.S. government shamefully turned its back on the Iranian resistance. He promised that the new U.S. administration would not repeat such a mistake.